A new survey published by Accident Advice Helpline, has revealed that hazards aren’t always being reported in the workplace. 1 in 6 said they would not report identified workplace hazards despite 25% admitting that they or someone they worked with had been harmed at work. The hazards that had been commonly identified in the workplace shows a worrying issue as they correlate with not only the biggest cause of injury in the workplace, but also fatalities. Slips, trips and falls are the biggest cause of accidents in the workplace. In fact, there were 20,294 reported incidents last year alone. While easily avoidable, 3 slip, trip and fall hazards were identified by the majority of workers. Falls from height also remains the main cause of fatalities in the workplace. Falls from height were responsible for 37 workplace deaths in the UK last year. Yet a shocking 29% of participants had seen someone working at height without following health and safety requirements. Machinery was also the cause of at least 9 deaths and 2,656 injuries. Reporting allows the business to identify and reduce risk in the workplace. This is incredibly important to employee safety as demonstrated by the statistics. Accidents will not only cause harm to the employees involved, but the entire business could be subject to prosecution, fines, a hit to reputation and even imprisonment. 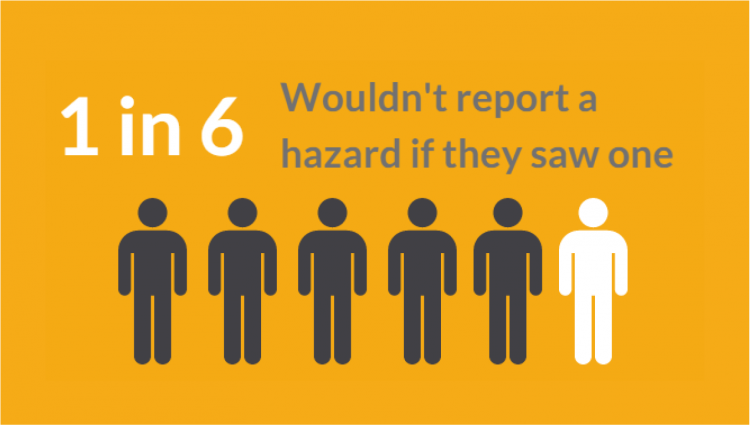 Surprisingly, 84% of respondents thought that reporting could make hazards less likely in their workplace. Read our blog on the importance of incident reporting. Incident reporting should be made a part of employees work day. However, this has to be encouraged by the employer and incorporated into your health and safety policy. If someone is injured or killed at work, their colleagues are likely to be affected in some way. Creating a safety culture in the workplace will help your employees to value safety look out for each other. While many may feel that a hazard is not going to affect them, accidents can happen to even the most safety conscious worker. This is particularly true as many of the hazards identified, such as slips, trips and falls, could affect anyone regardless of job function. Again, creating a positive safety culture should help your employees to want to take responsibility for the safety of themselves and their colleagues. However, incident reporting should also be made a requirement for all employees. Reporting should be incorporated into any policies and safety training to reinforce the responsibility each employee holds. Who an incident should be reported to should also be included in your policy and any safety talks or training. You could consider appointing a health and safety representative within each team to whom incidents should be reported to. Hazard reporting should never be about discipline but rather correction and prevention. Employees should not be punished for reporting a hazard and avoid assigning blame. You could consider setting up an online, anonymous reporting portal for your employees to prevent any worries. Risk assessment is a legal requirement for all workplaces. As your employees know the risk they face each day best, encouraging reporting will help you in this process. Could you staff signal for help in an emergency? Our easy to use smartphone app lets you know where your staff are and if they are safe. Contact us for more information and pricing.